We were up and about early on Wednesday to finish our to-do list. Our feet were aching but we had to make the best of our time in the city since we only had two short days there. We were dropped off at the train station again and were in DC at about 9 AM. 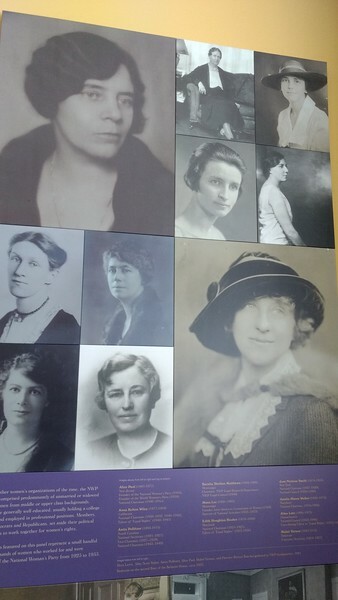 Our first stop was the Belmont-Paul Women's Equality National Monument and were one of the first to enter the doors. One of my favorite movies is Iron Jawed Angels and it is based on the Women's Suffrage Movement and tells about Alice Paul and other women who helped earn the vote for women. Since it is one of my favorite movies, naturally I wanted to see the museum. It turns out that the museum was an old house that they used during the "fight" for the Equal Rights Amendment. How cool is that?! Alice Paul actually lived there at one time! I loved this museum and wish I had more time to spend there. 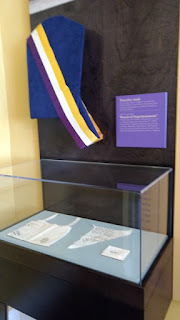 There were old artifacts, newspaper cartoons, old furniture (even an old desk that I think was Alice Paul's and Susan B. Anthony's!!! ), quotes, old banners, etc. that were used during that time. I liked that it wasn't all Suffrage stuff (even though I loved that), it had Equal Rights Amendment era stuff too. Please go there when you visit the DC area. This place was a highlight of my trip. 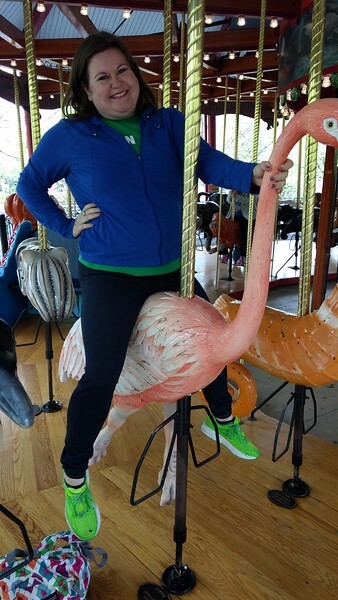 After the Women's Museum we headed down to the Smithsonian Zoo. Normally I am not a zoo kind of person, but there are only two places (that I have found at least) that have a flamingo carousel, and one of them is in DC at the zoo so of course I had to go! (The other is in Detroit and I'm never going there if I can possibly help it. LOL). Bucket list, check! Apparently there are some "famous" panda bears or something at the zoo but they weren't out when we were there. I wasn't too impressed by this zoo (I might have just gone on a slow day), except for the apes that went above your head on a wire from enclosure to enclosure. One of them even has a blanket (it might be a shirt) that he carries everywhere and had it with him. They said that he likes to show off in front of a crowd and usually only uses the enclosure during busy days. 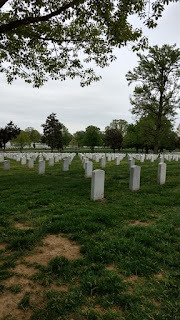 After the zoo we headed to Arlington National Cemetery via the subway system. We decided just to walk by ourselves everywhere instead of taking a formal tour. 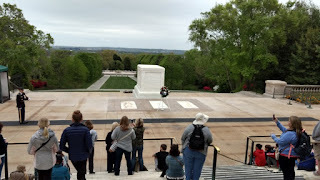 I was amazed at how big Arlington National Cemetery is! I had tears in my eyes as I saw row after row of tombs. We were there long enough to see the changing of the guard ceremony too. We were inside looking at the museum area when everyone rushed outside. We peaked out and realized what was happening and watched it. I didn't take video of that because I just wanted to focus on it and soak up the moment instead of always paying attention to my phone. I'm working on getting better at being present to the moment. We were leaving but we decided to stop by the Marine Corps Memorial, Ima Jima. Let me tell you, that thing is massive! It was so cool viewing it from all sides. One of my favorite pictures is the fire fighters recreating it on 9/11, so the original memorial was pretty cool to see. We saw the Lincoln Memorial and stood in the spot MLK did the famous "I have a dream" speech. 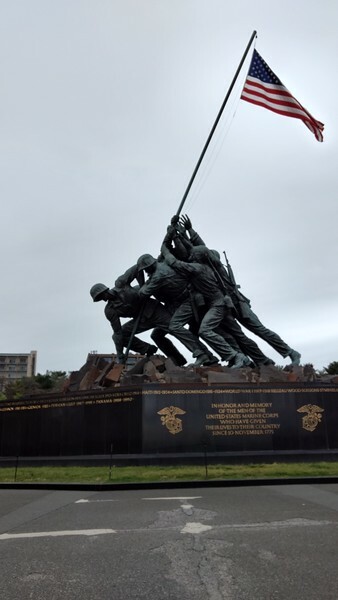 This monument was beautiful! 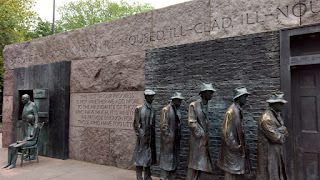 The Franklin D. Roosevelt monument was probably my favorite. So, a bad sign for my public school education (LOL) was that I had no idea that FDR was elected to four terms! For some reason I didn't know that any president had ever served for more than 2 terms. Duh! I was either out that day or not paying attention in class (you decide which it was). Anyway, it was my favorite because it encompassed things about him but also the era that he was President. Each of the four sections (one for each term) was something new about him or what was going on during the term. 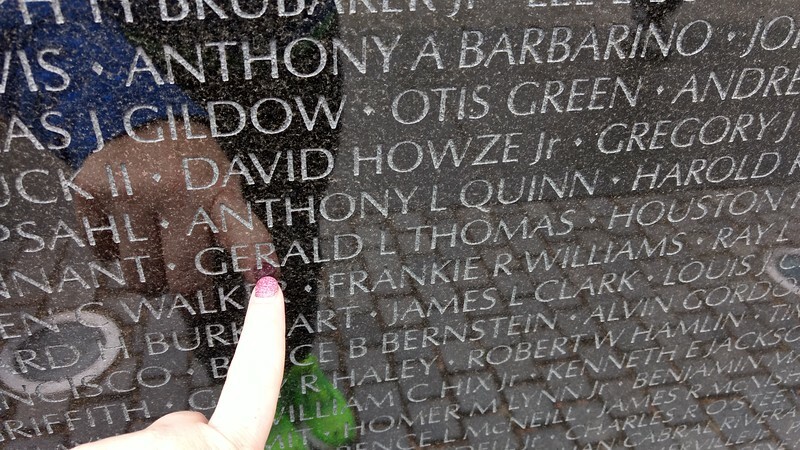 One of my family members (Mom's side-my grandpa's nephew) died in Vietnam and his name is on the memorial wall. 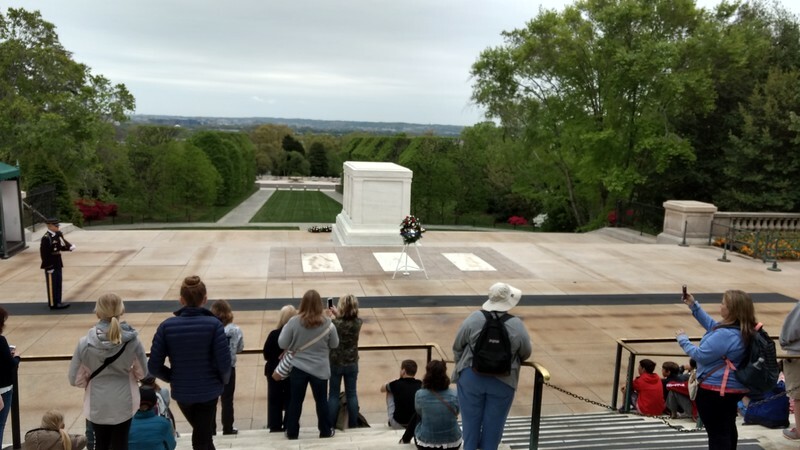 I didn't know you could bring flowers or some token for the section of your loved one, but if/when I go back, I will be sure to bring something. 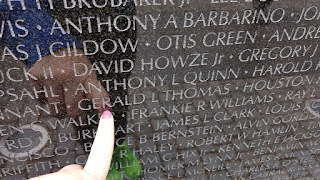 I liked how there is a book (several actually, they look like phone books and are in alphabetical order) that you can look for your loved ones name and find what section they are in, instead of looking at the wall itself. I found him easily and walked over to take a picture. 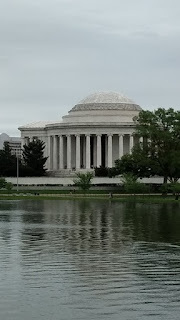 The Jefferson Memorial was alllllll the way around the other side of the tidal basin. I decided I really want to ride in a swan boat the next time I'm there because I kept seeing them while walking towards the monument. We headed to the White House on the other side this time and it looked just like I was picturing. You could get closer this time but there were still barricades. 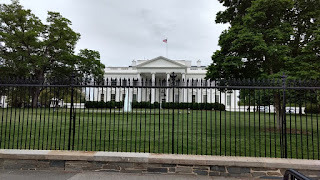 We took pictures and talked to a really nice Secret Service agent for a few minutes. After that we headed back towards the train to go back to the hotel. We crashed early that night because we had a 5 AM flight! There were a few things that we didn't get to while we were there. 2 days is NOT enough to see the city. Plan at least 3-4 days to see everything you want to see. Washington is spread out and we were bookin' it to each item. 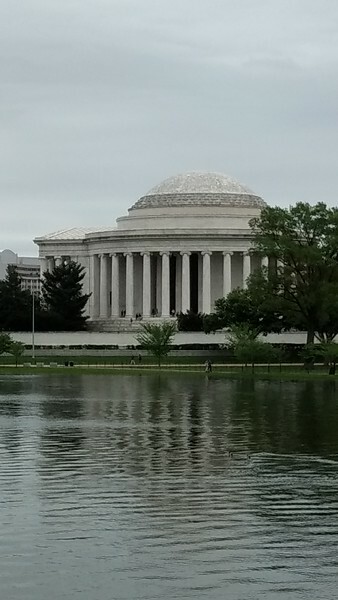 I saw a lot of things but here are some things I still want to see: Declaration of Independence and the Constitution (at the Archives), tour the inside of the White House (since it was a last minute trip we couldn't request to go in), see the 9/11 Memorial at the Pentagon, ride in a swan boat in the Tidal Basin, see the Cherry Blossoms bloom in the Spring, have a Georgetown Cupcake. 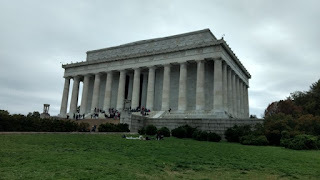 For more pictures go HERE and click on the Washington DC Link.